This year one daughter wanted to visit friends on Savary Island, while another wanted to visit one on Hornby Island. 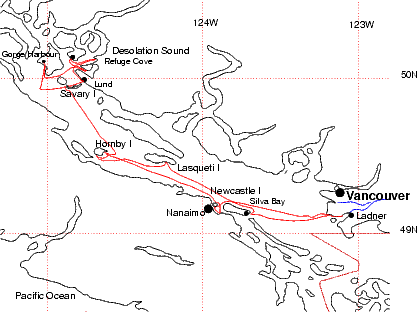 As it happened, we had been to neither before, though we had passed close by Savary in the eighties. After sleeping on board, we set off from the marina in Ladner with one of EK's friends (Arden) on board, and went across Georgia Strait to Silva Bay, then north to Hornby by way of Lasqueti Island (past the "whisky golf" military exercise area, which was fortunately not in use). Hornby is home to various ex-hippies, artists etc. and is a friendly place to visit. Petranella's friend's father runs a family-oriented campsite (called "BradsDadsLand") near the beach. We anchored nearby and rowed ashore, then walked up the road to the camp. In the evening we all went for pizza and live music at the "Cardboard House" bakery, served outdoors in the orchard, then retired to Alastor for the night leaving Petranella to stay with her friend at the camp. Next day we took Pet's friend Zephi aboard and raced EK on the windsurfer a couple of miles down the coast to Ford Cove, where I bought some SCUBA air and the children played on the beach for a while. After leaving Pet and Zephi with her parents, we set off to Savary Island (back across the strait), arriving in the dark and making good use of GPS and depth sounder. Savary is surrounded on all sides by shelving sandbanks so you have to dash in (figuratively speaking), drop crew etc. then retreat back to deep water. It was a popular resort in the 1930's and was sub-divided into small 1/4 acre lots (unusual for an island miles from any city), almost all of which (at least the ones round the edge) have their own private beach with acres of sand at low tide. The island has telephone but no electricity or water, as I recall - residents have wells, propane for cooking and refrigeration, and the odd generator. We dropped off Arden and EK to stay with their friend's family in their cottage, and stayed for a meal and to watch the sun set over the sea and Vancouver Island mountains (glorious). After supper we moved to the North side of the island to anchor and passed an uneventful night, but the next morning went gently aground. The sand is shallow for maybe 200 yards then slopes strongly off - I'd anchored in about 30 feet with a stern anchor shoreward, but the current and stern line had combined to push us around into shallower water. As the bottom was sand and the sea calm, I felt Alastor was fairly safe where she was and we went ashore to retrieve some sunglasses left at the cottage. Savary is home to thousands of "sand dollars" (see e.g. gma.org), which I'd often seen dead. The live ones look almost black covered in short furry spines. The tide had exposed a large expanse of sand so I left the dinghy tied to a dried-out mooring buoy, continued ashore and walked to the cottage which was about half a mile away. I stayed to chat while the children played on the beach building an enormous sand fort. When I returned to the dinghy, the tide had come in and I had to wade out to it. I went to check on Alastor, then returned with the bicycle, leaving the dinghy near the new shoreline secured with a small anchor and went ashore again. When we were ready to leave, the tide had come in further. I cycled along the dirt road inland and asked Mel, who was walking along the beach, to wade out and get the dinghy. Which she did, untying the anchor line and tossing it in the water - she didn't realize it was ours. We rowed back and looked for it, but couldn't find it. Leaving Mel aboard Alastor, I returned with a mask paddling the windsurfer, spotted the anchor in about 10 feet of clear water and swam down to it. Mel and I then sailed over to Desolation Sound for a couple of days, calling in at Lund for groceries and ice cream, and Copeland I. for a swim. We climbed one of the hills above Tenedos Bay one afternoon, and I went scuba diving briefly - there were lots of white jellyfish about 15 foot down. I was told later these are harmless, but at the time I wasn't wearing a full wetsuit and decided not to swim down through them with bare skin. The next day after stopping at Refuge Cove for supplies we motored down Malaspina Inlet to Grace Harbour. Last time (in 1986), relying on LORAN and paper charts, we had struck a rock here. This year I had bought a handheld GPS (Garmin GPSMAP76) and the "inside passage" charts on CDROM. Malaspina Inlet seems littered with unmarked hazards, but with nearly 5-metre accuracy on the GPS it was easy to choose a safe course, despite the relatively small monochrome screen. I would hesitate to abandon paper charts as yet, even with the larger screen on a laptop, but this is clearly a technology that is becoming "essential". Annoyingly, its dialect of NMEA is not understood by Alastor's Navico autopilot so I must still use the LORAN for course setting. Another "toy" this year was a portable DVD player, popular with those addicted to the small screen. I also experimented with a small video camera driving this - my camera was too basic to be really useful, but it's not ridiculous to imagine a mast-top camera used for lookout when beating to windward or running with full sail. We pottered round to Gorge Harbour for more ice cream and groceries, and then set off back to Savary. The wind picked up and we had a good run to Mitlenatch I. and a reach to Savary, arriving in the dark again. I took the dinghy ashore to pick up EK and Robin (another friend) and then rowed frantically against the current towards the cabin lights of Alastor, having drifted too far astern with EK rowing. The next day we headed back to Hornby to collect Pet, slowing occasionally for swimming and general messing about towing children in the dinghy, finally putting in to Tribune Bay where we went ashore for supper and Robin was stung by a wasp. After spending the night - the children decided to sleep on deck as it was so warm - we headed direct to Nanaimo in an attempt to catch the ferry back to Vancouver, so that Robin could get home early. Despite arriving before the ferry, which was late, EK and Robin just missed the fixed cutoff time and had to take the next one. We then moved to Newcastle island (so called from the coal deposits that were worked there some years ago) where it rained. I took the bicycle and GPS ashore and rode around the island when the rain stopped. The GPS turned out to be useless ashore - too many trees. It needs a good view of several satellites; subsequent experience shows it to be effective on the road and for downhill skiing, but not for hiking - at least not in BC, which is well known for its forests. Later in the day I rowed across the channel to Nanaimo for groceries, but decided to give the floating pub a miss this time. The next day the rain held off and we sailed back home to Ladner, just in time for the start of the school year. toys - GPS, DVD player with video input, small camera on mast..